Silver inlaid Australian opal and sugilite hoop earrings. 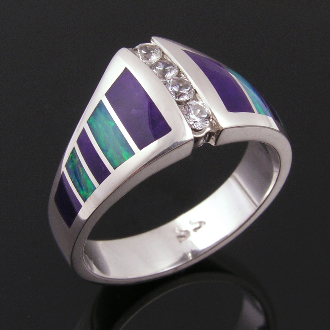 Australian opal and purple sugilite inlay sterling silver ring. The deep purple sugilite is separated by bright blue-green Australian opal on each side of the ring. Four sparkling white sapphires are channel set in the center of the ring. The white sapphires weigh .20 carats and are very good quality. White sapphires make a great diamond alternative at a very affordable price due to their hardness and diamond like sparkle. The ring is shown in a size 6 1/2 but may be special ordered in other sizes in about 4 to 6 weeks. The ring may be customized by changing the inlay stone colors or pattern. This ring would also make a nice wedding ring or engagement ring for someone looking for a unique symbol of their commitment.